The real wages of academics have fallen by 13% since 2008, one of the largest sustained wage cuts any profession has suffered since the Second World War. We write on behalf of EUSA and our 32,000 members, to actively encourage you to take strike action. In the short term this will indeed affect our education, but the long term benefits are significantly vaster. It is critical that students and staff struggle collectively. Not only to ensure that the sector continues to attract the highest calibre of people, but also so staff are able to focus on the job – not worrying about the rocketing cost of living. Needless to say, colleagues at the start of their career are hardest hit, including the thousands of EUSA’s postgraduate members who help teach. The demands are reasonable, and the more effective the action now the sooner we can get back to the reason we’re all here – education. It is for this reason that EUSA’s academic reps, who aren’t exactly our most radical bunch, have voted overwhelmingly in favour of actively supporting the on-going strike action. This decision has been met with broad approval from across the student body. Dozens of our reps and countless other students were out on the picket lines at 7am the other week, and have vowed to be there next time.We are actively encouraging our members not to cross the picket lines and to study from home.Education continues to be progressively marketised, fees continue to rise, power continues to shift away from ordinary staff and into the hands of the overpaid in Old College. At times like these it is vital that the university acts as a community and reasserts its stake over the corporate body. We do this by working together, and recognising that our struggles are in common. So again, we implore you, on behalf of your students, not to undermine the strike. And hopefully we'll be seeing you on the picket lines! 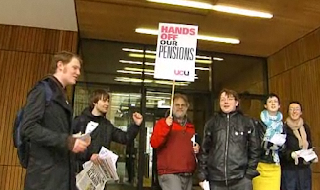 The photo above shows me picketing the Informatics Forum, surrounded by students during a previous strike in 2011.